State Rep. Mitch Greenlick, D-Portland, gets in position for a group photo in the Oregon Capitol in Salem, Ore., Monday, Jan. 14, 2019. As public health officials work to tamp down a measles outbreak in the Portland metro area, Oregon lawmakers are preparing to take up legislation that would increase the number of children vaccinated for the disease. State Rep. Mitch Greenlick, D-Portland, confirmed to OPB on Thursday that he’s ordered up a bill to eliminate a provision of Oregon law that allows parents to forego vaccinations for their kids because of religious or philosophical reasons. Since December, dozens of measles cases have been confirmed in Oregon and Washington. The vast majority, 49, were located in Clark County, Washington. Multnomah County had four confirmed cases as of Thursday, and King County, Washington, had one. Health officials said the outbreak of the highly contagious disease is only possible because of low vaccination rates in the Pacific Northwest. Around 7.5 percent of Oregon kindergartners are unvaccinated, according to the Oregon Health Authority — the highest rate in the country. Experts say an immunization rate of roughly 93 percent is necessary for a population to achieve “herd immunity” for measles. Greenlick said he’s long opposed a state policy that allows parents to skip out on vaccinations for non-medical reasons once they view online educational materials or talk to a doctor. Removing the exemption would be a controversial move in an age where some parents distrust vaccines. But Greenlick said he thinks his fellow lawmakers may be especially open to killing non-medical exemptions with an active public health crisis playing out. Gov. 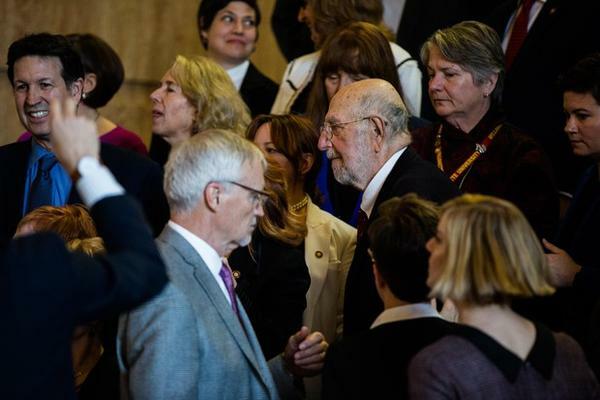 Kate Brown, who has increasingly called on parents to vaccinate their children, suggested earlier Thursday that she’s open to legislation like Greenlick is preparing. “I think we’re probably going to tighten the law around Oregon’s immunization strategy,” Brown said. Lawmakers last considered altering the non-medical exemption policy in 2015. That bill faced pushback and died in committee after a single hearing. Greenlick said he expects he’ll have a copy of his bill to pass around to other lawmakers within days, and that it will attract a bevy of co-sponsors. Copyright 2019 Oregon Public Broadcasting. To see more, visit Oregon Public Broadcasting.